How much will it cost to renovate my kitchen in NY or NJ? Regardless of where you live, making the decision to renovate your kitchen can require a great deal of financial planning. It’s a major undertaking, one that can bring along unexpected costs you didn’t plan on. And if you live in an area like New York or New Jersey where it can often seem like everything is more expensive, you might be even more concerned about the potential costs of a remodel. There are several factors that can help you predict or estimate the cost of a remodel. Though every home is unique, and unexpected costs and tasks can spring up during any home renovation, this guide should be a helpful tool as you try to determine the full cost of your kitchen renovation. While it might not leave you with a set dollar amount, it will give you a clear picture of what to factor into the cost so that you’re not slammed with unexpected drains on your budget. It will also show you how to compare and evaluate the value of a remodel for your unique situation in order to help you make the right decision for you and your future. First and foremost, you should expect that a remodel in a home in New York or New Jersey will cost more than the national average. But the ratio might not be as dramatically high as you fear. A recent estimation released by HomeAdvisor found that average renovation costs in New York and New Jersey for 2019 are 9-10% higher than the national average. That means you can expect to pay approximately 10% more for a renovation here than the average American pays. That’s certainly not chump change, but at least we’re not talking about doubled prices. For example, the average New Yorker spends $29,400 on a full renovation of a larger kitchen (according to data from Houzz), while the average native to San Francisco spends $44,000. So when you’re feeling bad about your renovation project costs, just remember—at least you don’t live in San Francisco. So how can you keep your renovation costs manageable while still getting everything you want and increasing your home’s value? It’s all about knowing exactly what factors into the cost of a kitchen renovation. As you might expect, the size of the kitchen you’re looking to remodel plays a large part in the potential cost. The larger the kitchen, the more you can expect to spend across the board. But the size of the kitchen as a whole isn’t the only factor—consider the surface area of specific items and surfaces you want to replace. Planning on installing a brand new backsplash? How much of your kitchen will you need to cover? And what about the size of your countertops? The larger the surface area, the greater the material and installation costs. This applies to floors, walls, and cabinets, as well. When you contact a licensed contractor or handyman, make sure you know the area of not only your kitchen but the specific surfaces to be renovated. This will help them give an accurate estimate when including the other factors of your potential reno project. 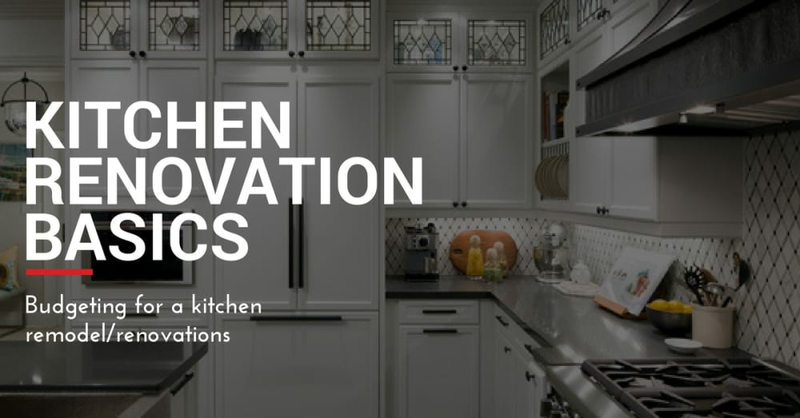 There are typically three general types of renovations you can undergo in your kitchen—a partial renovation, full renovation or gut renovation. But what exactly distinguishes one from the other? The difference can mean hundreds or even thousands of dollars. A partial renovation generally involves removing and replacing finishes while keeping most things in the same place. That means that structurally and arrangement-wise, your kitchen will remain the same. A partial renovation is the equivalent of a fresh coat of paint. It’s the same kitchen, but cleaner, more stylish, or more in line with your personal décor preferences. In some situations, a partial renovation is all you need to instantly fall in love with your kitchen all over again. If you generally like the bones of your kitchen, its space, design and arrangement, but the outer shell is a bit dated or some the appliances could use replacing, a partial renovation is likely right for you. It’s a less time-intensive experience than a full renovation. The other major benefit? Partial renovations can be dramatically less expensive than full or gut renos, for obvious reasons. No structural work means less time, less materials and less overall expertise required. The downsides of a partial renovation are just as obvious—the overall functionality and design of the kitchen remains the same, which means any issues involving space, accessibility, safety, or “feng shui” will remain. If you’re looking to correct or improve in any of those areas, consider a full or gut renovation. A full renovation involves major layout changes to your kitchen, including moving plumbing or gas lines or making structural changes. This is the next step up in the renovation ladder, and though it comes with expected additional costs it also brings new freedom to be creative with your kitchen renovation. If you’ve always wished you had a kitchen island, or hated the location of your refrigerator in relation to the rest of the kitchen, a full renovation is for you. It offers a great deal of flexibility when it comes to placement of appliances, cabinets, and countertops, and also offers you the option to add appliances you didn’t have before. The advantages of a full renovation over a gut renovation are generally cost-centric. With a full renovation, you generally leave drywall, floors, ceilings and lights in place, which is beneficial in two ways. First, it obviously involves less materials, demolition, work hours and overall time. But it also somewhat protects you against unexpected, surprise discoveries that can balloon up the cost of your renovation. Essentially, the more of your kitchen you pull apart, the greater your chances of discovering something like rot that you’ll then be responsible for dealing with safely and promptly. Of course, a full renovation that involves structural changes will cost more than a partial reno that only removes and replaces finishing elements of your kitchen. Keep this in mind when estimating costs. A gut renovation is necessary when you want to fully reset your kitchen from the ground-up. It involves stripping drywall, removing flooring and ceiling, and stripping lights. It essentially breaks your kitchen down to the structural basics. While this is of course the most expensive approach to a renovation, it also gives the most flexibility and allows for you or your designer to be the most creative. With this approach, you can end up with an entirely new kitchen that’s customized to your exact specifications and preferences, everything from arrangements, size, appliance installation, flooring type, walls, plumbing, and lighting to plumbing, hardware, sinks, faucets and cabinets. It’s the most complete renovation you can complete in your kitchen, but it brings its own set of potential complications. Gut renovations have the most potential to increase in cost as issues like dry rot or asbestos might be discovered along the way. That being said, if your home isn’t several decades old you should be able to put together an accurate estimate of what to expect. What follows is a list of the components of a renovation you’ll want to consider when estimating costs and budgets. These are the most commonly replaced or updated elements of a kitchen. Whether you’re going for a partial renovation and simply repainting your cabinets or tearing out the entire cabinet structure and starting from scratch, it’s important to know where you stand as far as what you want from your cabinets in a renovation. Another common replacement, your kitchen countertops will likely factor into your kitchen renovation project. Your countertop costs will vary depending on the material you want and the overall area of your counter space. If you’re installing more countertops, the cost will obviously increase further. Designed for both functionality and beauty, your kitchen appliances should be both effective and stylish when integrated into your new kitchen renovation. Remember that you can often save costs by purchasing appliance packages, which will also provide a seamless look in your kitchen with a matching appliance set. Adding texture and color to the wall surfaces below your cabinets is a powerful way to make a kitchen look modern and stylish. While backsplash often isn’t the most expensive element of a renovation, you’ll want to factor it into your budget. Going for a gut renovation? Then that means demolishing and replacing walls and flooring. This can be one of the more costly elements of a renovation, so be sure to be clear with your contractor up front if this is something you want to include in the project. That will save you from unexpected costs down the road. Small elements of your kitchen like hardware and fixtures can make a big impact in your kitchen renovation. Don’t leave them out of your designs or budget, as they can make the difference between a so-so reno and a dazzling new kitchen design. Don’t leave out your plumbing and kitchen sink(s). These elements can involve serious work, but the benefits can be enormous. And remember—if you want your sink or faucet in a different location, that will involve plumbing work. Sick of your standard, boring kitchen lighting? If you just want to replace certain fixtures with something updated and new, your costs may be fairly low. But adding new lights or moving lights to new locations can involve some serious wiring work, so be sure to add this element to your budget decisions. Unless you’re an experienced interior designer, you’ll likely want some support and guidance when it comes to designing your new kitchen renovation. With the help of a skilled contractor, you can design exactly what you’re looking for while accounting for elements you might not consider alone. That being said, you’ll need to factor design costs into your renovation budget. One area where many potential renovators fail to factor in costs is in the preparation for the renovation. This involves not only the costs and time associated with obtaining permits, but also demolition-related tasks such as leveling floors, demolishing walls, removing asbestos, and the costs of dumpsters and site prep tasks. Next comes the behind-the-scenes work, including framing, insulation and drywall, wiring (including outlets and switches) as well as plumbing and heating/cooling systems. If you’re looking for a full or gut renovation, these are all factors and costs you’ll need to consider. When all of these factors and potential costs are listed out in front of you, it might seem a bit overwhelming. But the good news is that by finding the right contractor that you can trust, you’ll have a dependable partner who can help you make decisions that will save money and get you well on your way to your dream renovation. This guide is designed to ensure that when you have that conversation with your contractor about putting together a cost estimate, you’re armed with all of the information you need so that there won’t be surprises along the way. Remember that renovation a kitchen should be a thrilling, exciting experience. It can not only increase the value of your home, but can increase the joy you experience while living in it. The more you arm yourself with research and data about the costs of a renovation, the more relaxed you can be in knowing that you won’t be blasted with an unexpected cost you didn’t account for at the beginning. Finally, it’s important to remember that your relationship with your contractor is a vital one. Seek out an individual or business with a proven track record of timely and clear communication, quality work, and fair pricing who will be able to bring your dream kitchen to reality.